The worldwide attention that his presidential bid attracts also means scrutiny and criticism – turning the campaign into what Jean called a "combat sport." He responded directly Thursday to a revelation published this week on the U.S.-based website The Smoking Gun concerning his unpaid U.S. taxes. 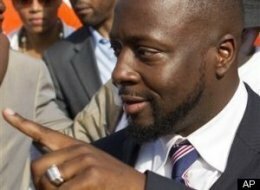 "First of all, owing $2.1 million to the IRS shows you how much money Wyclef Jean makes a year," he said, pledging to publish an accounting of his finances online and to repay the money he owes. The singer also fumed when aides told him that actor Sean Penn, who has been managing an earthquake-survivor camp in the Haitian capital since the spring, had accused Jean of not spending enough time in Haiti after the quake and misappropriating $400,000 of the $9 million his charity, Yele Haiti, raised after the disaster. "I just want Sean Penn to fully understand I am a Haitian, born in Haiti and I've been coming to my country ever since (I was) a child," he said. "He might just want to pick up the phone and meet, so he fully understands the man." Jean stepped down from his chairmanship of Yele on Thursday ahead of his run for office. The organization has been accused of pre-quake financial improprieties that benefited the singer. Before campaigning can begin, Jean must be cleared to run by Haiti's eight-member provisional electoral council. Among the requirements he must fulfill are proving he has never renounced his Haitian citizenship by holding another – namely, U.S. – passport; and that he has been a resident of Haiti for the last five years – which by most accounts he has not. The campaign will argue that Jean's status as a Haitian ambassador-at-large, a post he was awarded in 2007, exempts him from having not spent more time in the country of late. If approval comes, Haiti's particular brand of Byzantine and often brutal politics will really begin. Jean's charisma and popularity in Port-au-Prince's vast slums could draw comparisons – some favorable, others not – to the popular but divisive former President Jean-Bertrand Aristide, who was flown into African exile aboard a U.S. plane during a bloody 2004 rebellion. This is only the begining of the criticism he'll receive if he wants to be president. I hope he's prepared.